New Delhi (Team Vishvas). We came across a photo on social media where a man could be seen standing with BJP chief Amit Shah. According to the description. 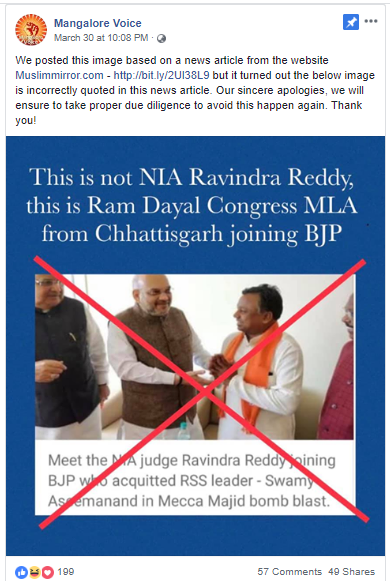 According to the description, this person is NIA judge Ravinder Reddy who acquitted RSS leader Aseemanand in the Mecca Masjid blast case and he has joined BJP. 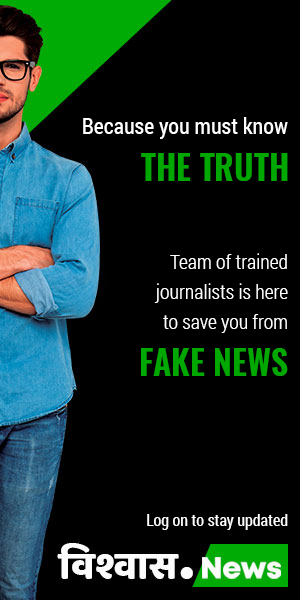 In our investigation we found that this claim is absolutely wrong. 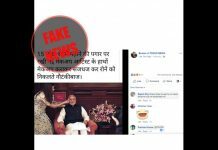 The person present in the viral photo a leader from Chhattisgarh Ramdayal Uvik. 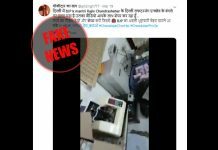 The description in the viral post says, “This is a joke around our judicial system? 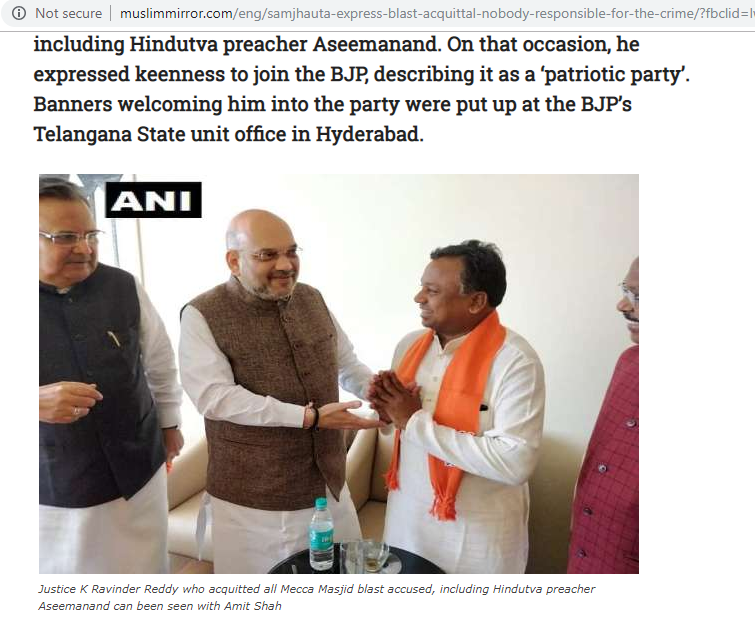 The NIA judge who released Aseemanand has joined BJP”. 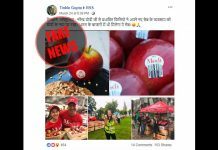 We first performed a reverse image search on this viral photo. 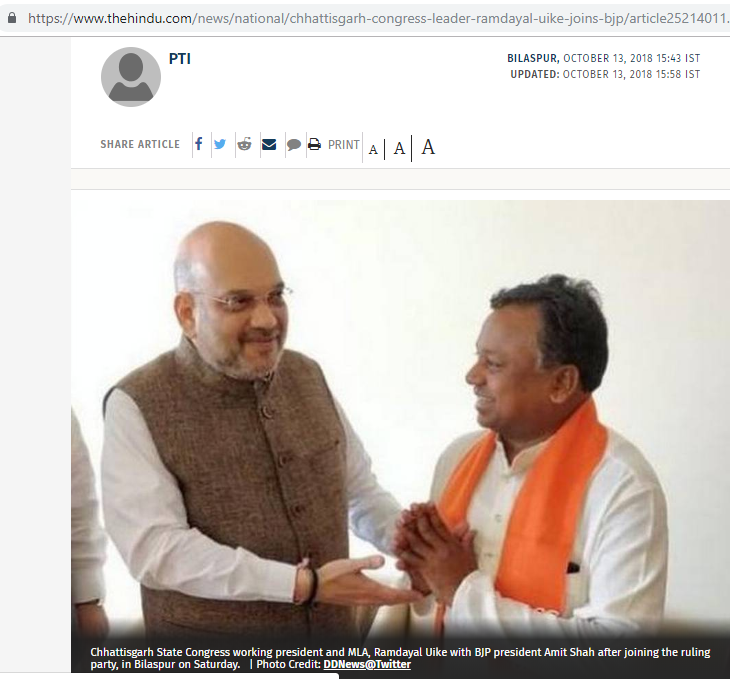 On the very first page, we found a news story of ‘The Hindu’ with the headline ‘Chhattisgarh Congress leader Ramdayal Uvik joins BJP’. This news was published on October 13, 2018. 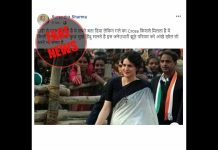 We searched and found that on Oct 13, 2018, Chhattisgarh Congress leader Ramdayal Uvik had joined BJP. The viral photo was taken at this occasion. 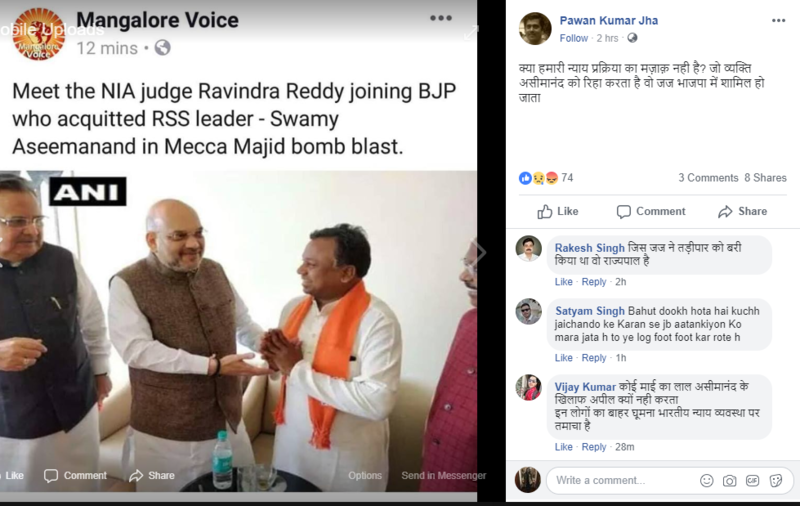 Now we had to find out weather Ravindra Reddy has joining BJP or not. 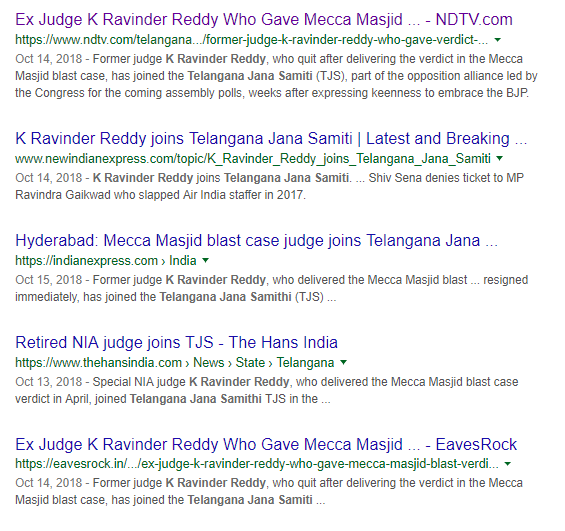 When we searched on the internet, we found a story of NDTV posted on October 14, 2018, which states that the judge who acquitted RSS leader Aseemanand in the Mecca Masjid blast case, has joined Telangana Jana Samiti (TJS). This photo was first shared by a Facebook page named Mangalore Voices whose screenshot later went viral. We opened this page and found an apology post pinned at the top. 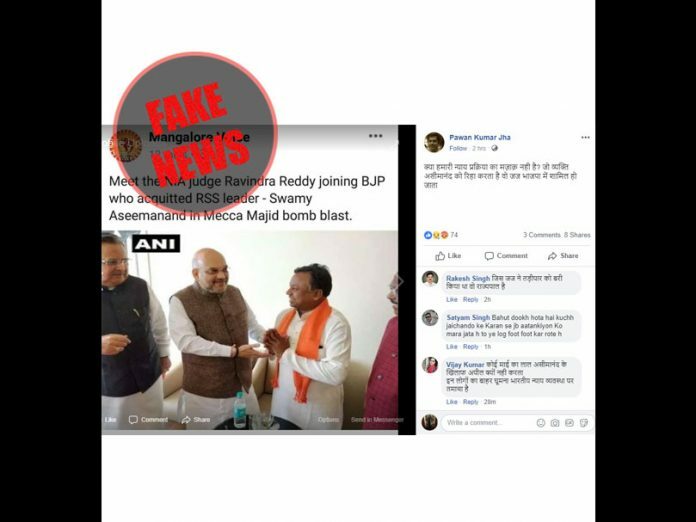 The apology was regarding the viral post that said Ravinder Reddy has joined BJP. 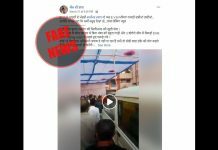 In this apology post, it is written that the page picked this viral photo and information from a website called muslimmirror.com and the admin of the page is sorry for not fact checking it before posting. 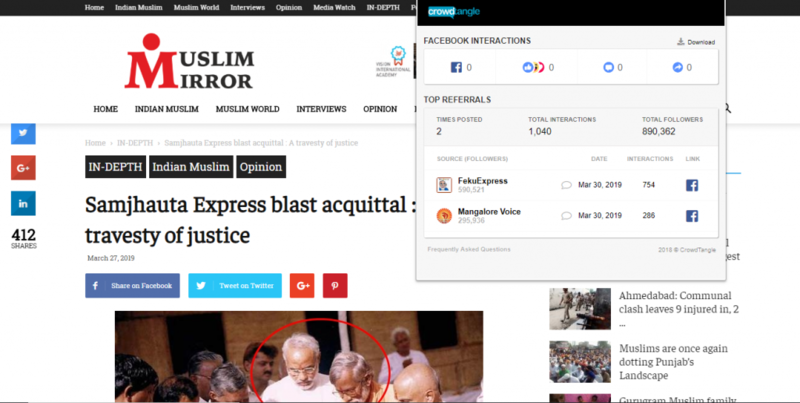 We opened this website, muslimmirror.com, and found that this photograph and information was used in an article with headline ‘Samjhauta Express blast acquittal: A travesty of justice’. This article has got more than 1,040 interactions on social media so far. 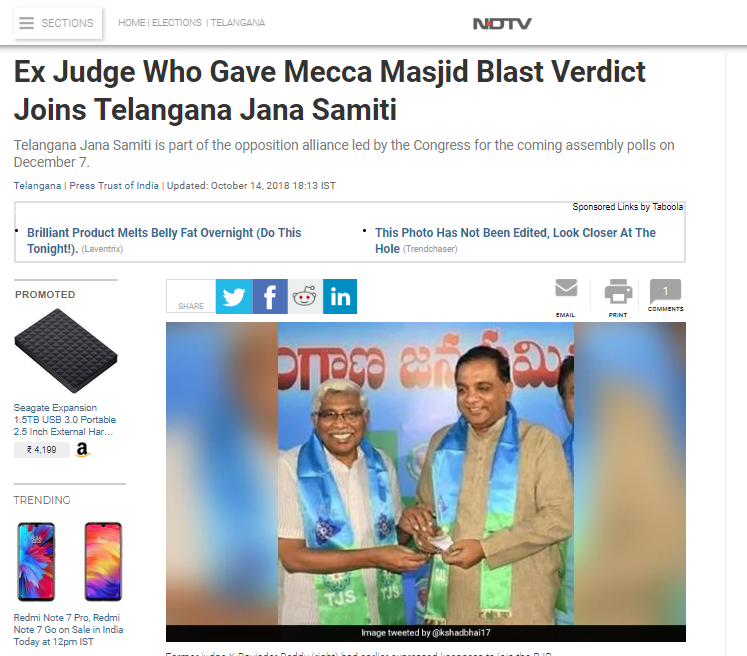 Conclusion: In our investigation we found that Justice Ravinder Reddy, who acquitted Aseemanand in the Mecca Masjid blast case, has not joined BJP.